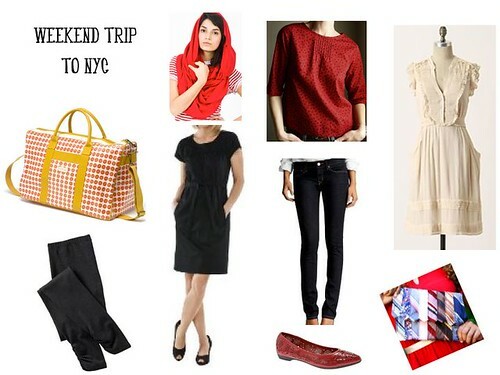 On the plane, I’d wear an easy travel dress (with pockets, please!) over a pair of leggings and with a big circle scarf (which doubles as a blanket if the plane is too chilly). I would pack a pair of stretchy skinny jeans for going shopping and visiting museums, and I would pair them with a handmade blouse. I’d also bring a cute clutch and some comfy flats, for walking all over the city and seeing the sights. And I’d bring a spare dress for a friend’s birthday party on the Jersey Shore (but not THAT Jersey Shore). Then on the way back home, I’d read books on my iPad** (or I’d just read some books that I’ve been meaning to get to). Doesn’t that sound nice? *I like when blogs do pretty little fashion boards or style inspiration or tips and breakdowns. So I’m giving it a shot.